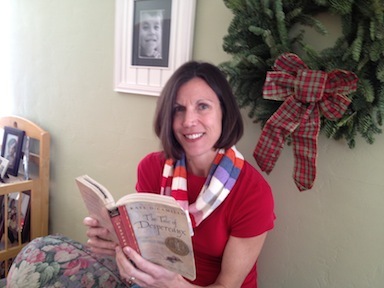 If you love children's literature, this blog is for you. At the rate I'm going my short list is going to be anything but. There are so many exceptional titles. Thankfully, I'll have my fellow Round 1 Middle Grades Fiction panelists to help me sort it out. Here are three well-written and wonderfully readable books. 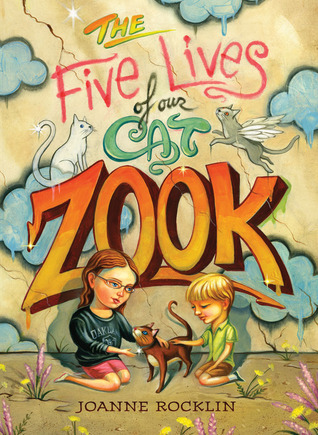 The Five Lives of Our Cat Zook is story of love and loss and moving on. Big sister Oona uses her vivid imagination to craft adventurous tales for her little brother Fred about the previous lives of their ailing cat. Oona and Fred live in a tiny apartment with their mom. Their father has passed away, and both of the children are still dealing with the loss - Oona is sad and protective, and Fred misses the dad he is slowly starting to forget. When her mother starts to date, Oona becomes resentful and suspicious. When her imagination and catnapping plans get Oona into trouble, she makes some discoveries about the real life Zook led before he wandered into their lives and learns to open her heart to possibilities. Joanne Rocklin is the author of this touching story, and I adored Oona and her relationship with Fred. I loved that Rocklin added little habits and details to Oona's character that helped me visualize and connect with Oona. I enthusiastically recommend this book to kids (especially girls) in the 9-10 age range. It feels to me to be an early middle grades story. 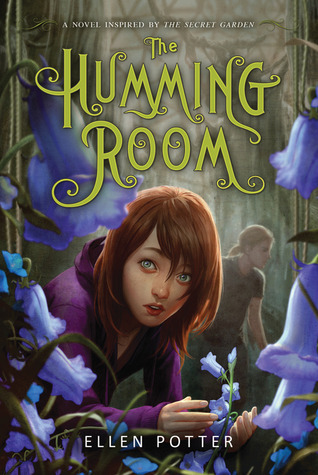 Ellen Potter is the author of The Humming Room, a Secret Garden inspired story about an antisocial orphan who would rather commune with nature than communicate with people. Potter's main character Roo was safely hidden under a trailer when her father and his girlfriend were murdered. She loved her dad, but he was troubled and didn't take care of Roo properly and his girlfriend was neglectful and mean. Without nearby family, Roo ends up with her eccentric uncle on his private island. I loved the mysterious feel of The Humming Room. The uncle's wife had died and there were rumors the uncle was to blame. Eery howling noises can be heard throughout the uncle's home - a former children's tuberculosis sanitarium, and Roo discovers a beautiful garden hidden within the walls of the former hospital. Oh, and did I mention the ghost boy who can be seen rowing his boat on the misty river? Potter definitely scores with this suspenseful story reminiscent of Jane Eyre (for kids of course.) I recommend this book for kids ages 9-12 who like mystery and quirky, strong characters. The third book of this outstanding trio is The Lions of Little Rock by Kristin Levine. I can't stop talking about this book. Marlee is twelve years old and scared to speak. Really. She doesn't speak to anyone outside of her family and a couple of friends. She has a lot to say, but she's too scared to say it. But Marlee's wordless world changes when she starts seventh grade in 1958. Marlee lives in Little Rock, Arkansas. Laws are changing and African Americans are gaining rights they've never had before, but the segregationists of the south and the governor of Arkansas are against the integration of public schools. When Marlee meets a new friend, it throws her family into the heat of the segregation/integration battle. This book is outstanding! It has incredible crossover appeal and would make a wonderful read aloud for a middle grades social studies teacher. I also recommend this story to middle grades and young adult readers who like strong stories of friendship, loyalty and human rights. And parents, you'll love it too. Oh my funny on the short list! I think I am going to have to go with a long short list. Will move these three up the TBR. Have a read-at-thon planned this weekend so I'll be reading reading reading. An amazing book with a great meesage! "Oh, magic hour, when a child first knows she can read printed words!" Moved to Facebook Open Page! I am a teacher, a mom, a wife, a friend, a reader, a writer, a coach and a designated driver. I write under the name Ali B. I am the author of the Soul Jumpers series.